Last Monday was an important day. It was the day when everything that needed to find a home in the studio had a home, everything that needed removing was removed, everything that needed a label had a label and everything that needed cleaning had been cleaned. Yes, even the windows! It was the day that my beautiful studio was ready for it's first students! It will probably never look like this again; all those virgin drop cloths will soon be covered in random colourful marks for a start. But for now let me walk you through it. 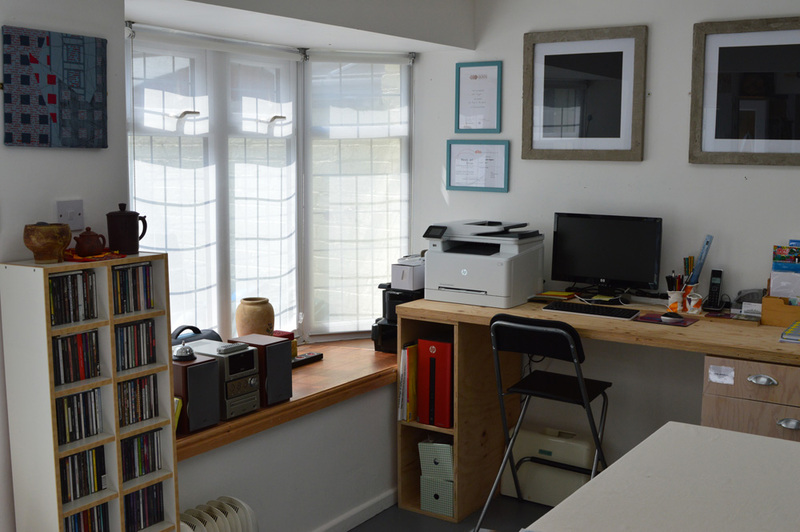 The studio is 8.5 metres wide by 5.5 metres deep. One long wall faces south and contains two bay windows and a set of french doors - so lots and lots of natural light which is supplemented by six large LED ceiling panels. The long back wall is mostly a design wall, useful for putting up teaching aids and looking at students work. One side wall is the 'wet' area with two sinks, two tea urns for hot water, a fridge, cupboards and counter top. I still need to install a washing machine. The other side wall is the 'dry' area. This is where my PC and laser printer sit. It is where I store all my finished work and work in progress behind a white curtain that can also double as a design wall. And the very important bit - it has the tea and coffee area! In between there is my large print bench with cupboards and shelves underneath. And six student 'work stations, each with height adjustable 180 x 80cm bench, stool and storage trolley. I want to provide all the equipment and media needed for each of the workshops. Wherever possible the 'requirements' lists will be limited to fabric, the means to take work home, apron and notebook. Most of my workshops are suitable for beginners who might not want to buy a lot of stuff up front - although I'm going to work really hard at getting them / you all thoroughly hooked on dyeing and printing! Have a look at my workshops at www.leahhiggins.com/workshops and I hope to welcome some of you soon in the Urban Studio North.